If you are contemplating a really serious expedition to a high peak then you will have to look for a top of the range, heavy-duty mountain tent. These are typically classed one notch above 4-season tents (sometimes they are just called winter tents) and are known as expedition tents or mountaineering tents. They have sturdy frames with extra pegs, ropes, guys and poles to withstand strong winds and heavy snow. In many cases, unless you are climbing on a really high peak, you can often actually just get away with using a 4-season tent without having to splash out the extra money needed for a fully-fledged expedition-worthy tent. But if you are going to one of the major peaks (Denali, Everest, K2) you don’t want to mess around. 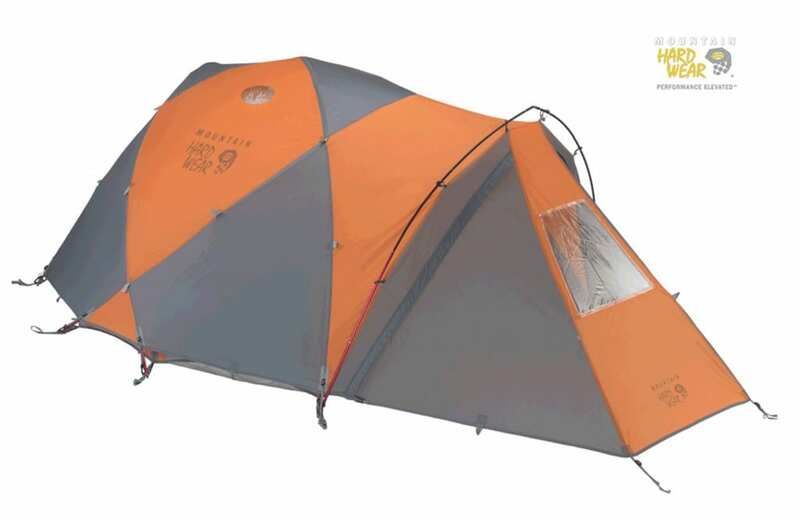 Even Aconcagua or Mera call for proper expedition tents because if the wind picks up it can slam right through a tent that isn’t sturdy enough. In serious conditions you may also want to supplement the standard tent with extra ropes to stake it out. You may also want to consider internal guys or stays that help tie the tent together from the inside to improve its ability to shed wind. A good 4-season or mountain tent will also usually have deep snow pockets that can be buried into the snow for added stability and to prevent wind getting in under the tent and threatening to blow it away. A typical modern high-mountain tent will have a frame made of aluminum or a similar, high-strength yet light-weight alloy. Whatever you do, avoid tents with glass fiber poles. This may be good for going on little fishing trips or to festivals but I’ve seen the poles on those babies snap in the slightest breeze. Aluminum or other metal alloys will bend rather than break, which gives the tent a much better chance of surviving a serious storm. There are a variety of different frame and pole systems out there from tunnels to geodesic domes. They each have their advantages and disadvantages yet all are designed with the same idea in mind, to shed wind and snow and to spread strong loads imposed by gusting storms. The better ones will also use advanced methods of joining poles to one another as this is a notorious weak spot in most tents. The Mountain Hardwear EV2 is one of the better ones. Its Atlas pole system has sophisticated engineered joins to reduce the risk of breakage at a point of likely failure. In general you’ll get an expedition tent that can sleep two or three (though some solo versions also exist). Just remember that whatever the printed number, it can be quite a squeeze. I generally would prefer to go for a 3 man tent rather than a 2 man tent, because all of your gear can take up a lot of space and the extra weight is not that much. Manufacturers of quality mountain tents know that every ounce they add to the tent is an ounce you will have to lug up the mountain with you. There is also a bit of a virtuous cycle in being small as the bigger a tent gets the greater the stress that winds and snow can impose on it so tents get heavier a lot faster than they get bigger. Still you will need some room and most have a vestibule, which is kind of like a porch on a tent. It is an extra extension of the tent’s main outer layer that helps make it more aerodynamic while also giving you place to store your gear and cook out of the wind (remember to be careful, I can’t tell you how many tents I’ve seen that have been burned through by an over enthusiastic gasoline stove that turned into a flame thrower). And remember too that you will have quite a bit of gear with you on a serious expedition, so you’ll need all the room you can get. In many cases people will buy a tent supposedly rated for 3 people and use it for two to make up for all the extra space your gear will take. Among some of the most popular expeditiong-grade tents are the North Face VE-25, which has been a stalwart of expeditions to the Himalayas and to Denali for years), the Mountain Hardwear EV2 or Trango and Marmot Thor. Each of these is a serious mountain tent that would likely see you through some of nature’s most extreme conditions. They are also made by some of the most trusted brands in outdoor gear. You find find reviews of them on this site and also get full specifications on the latest models directly from the manufacturers. If you are just planning on doing ordinary backpacking and hiking be sure to look at the range of lightweight camping tents and backpacking tents (some of which are also reviewed here) as you really need not spend the kind of money buying an expedition-grade tent that will be heavier and more expsensive than you need. If you are only just starting to take up mountaineering or backpacking, one of the most expensive bits of gear that you will have to get is a decent mountain tent. To start out you should probably try to share with friends or borrow so you can get a feel of what you need but at some point you will have to plunk down some fairly big money. Now a lot of what you get, and how much you spend, will depend on what you are planning to do. If you’re doing backpacking and the like you can get away very happily with a simple tarp shelter. These need not cost very much at all and will in fact be a lot lighter and easier to carry than a fully-fledged high mountain tent. But if you are going above the snowline or into heavy weather then you really need to get a serious tent that will stand up to the rigours of nature at its most spectacular. Most of the best mountaineering tents will have a geodesic or tunnel type of frame. These are incredibly strong for their weight and are designed shed wind-loads and stresses really well. There is quite a bit of flex in them so they will lean a bit too during a strong blow but that extra-flattening just helps get the wind over the tent and pushes it down. Be sure to go for aluminium or similar metal in the poles. If someone tries to sell you glass fibre poles in an expedition tent they are pulling your leg. Those puppies will snap faster than you can say the word. At worst (usually) an aluminium pole will flex. The technology that goes into every detail is quite impressive. The Mountain Hardwear EV2, for instance, uses poles that it calls the Atlas system that use very strong and light alloys with special insets to reduce the risk of a break at the join, which is where the stress is always highest. The newest tents these days will often be single walled made from some sort of breathable fabric that is both tough enough not to tear but also waterproof and breathable so that some of the water vapour you expel during the night can escape (though in truth if it is cold it will just freeze on the inner wall, if it even leaves your sleeping bag, that is).But there is also nothing at all wrong with a double-walled tent. They are a bit heavier and take up a bit more room but also also sturdy and roomy. Some of the best (such as the North Face VE 25) have great vestibule space for cooking and storing some of your gear in. When looking at tents you want one with enough guy ropes so that you can really secure it against a strong wind. You also want a big bucket-style ground sheet that comes up a good few inches to keep you dry and an outer (if you have a double-layer tent) that sheds snow but also tucks right into it so that you don’t get wind coming up underneath it. It may be tempting to go for the biggest tent you can but just remember that space can be at a premium when you are at a high camp. You may have to really tuck into quite a small ledge, especially if you are looking for the most sheltered spot, so sometimes smaller is better. Even if it means you are a bit cozier with your tent-mate than you would have planned to be. There are a quite a few brands when it comes to mountaineering and expedition tents but the three that stand out on big mountains such as Everest or Denali are The North Face, Marmot and Mountain Hardwear. Oh, and these photos and the one at the top are from an expedition I led about five years ago to Mt Mera in Nepal. The top photo is the view from my tent at high camp at about 5,800 meters (the summit is closer to 6,400) and this photo here was further back down the trail.